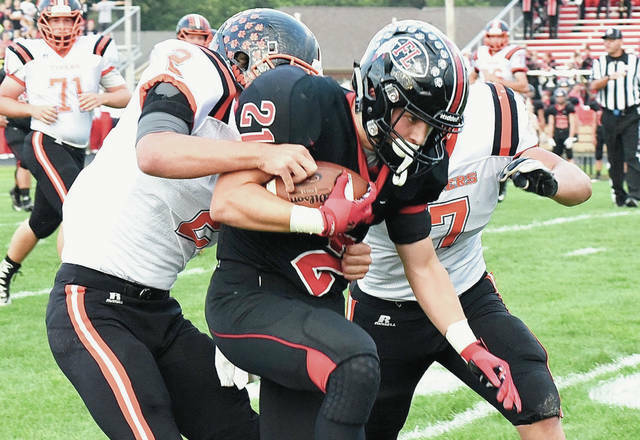 Fort Loramie running back Carter Mescher runs while being taken down by two Ansonia defenders during a Cross County Conference game on Sept. 21, 2018 in Fort Loramie. Ansonia is one of several schools that may vote to leave the CCC early next month. A fractured Cross County Conference could become officially split in the coming weeks, leaving Fort Loramie as one of four schools in the league. On Jan. 18, school superintendents, principals and athletic directors from the 14 CCC member schools met in an emergency meeting to discuss the future of the conference. Miami East superintendent Dr. Todd Rappold said four of the 14 CCC schools — Miami East, Bethel, Covington and Fort Loramie — were told the other 10 schools planned on exiting the conference. “At the end of November, a group of schools from the Cross County Conference started meeting to discuss the possibility of leaving the conference,” Rappold said. “Four schools, Miami East, Bethel, Covington and Fort Loramie, were not at those meetings. What we were informed of (Jan. 18) was that those schools planned on exiting the CCC. The schools that verbally announced their plans to leave the CCC are Newton, Ansonia, Arcanum, Bradford, Franklin-Monroe, Mississinawa Valley, National Trail, Tri-County North, Tri-Village and Twin Valley South. Newton and Bradford are the only two of the 10 schools located in Miami County, the rest are in Darke and Preble counties. “Because of the ongoing negotiations and discussions between several districts concerning athletic conference affiliation, and out of respect for this process, we will not have any specific comments until those discussions and negotiations have concluded,” Newton superintendent Pat McBride wrote in an email to the AIM Media Midwest. “Once things have been finalized, we will make a full and complete statement. In general, every district must do what they consider to be best for their students and student athletes. Rappold said there was no official request to leave the conference submitted at the Jan. 18 meeting, but that the remaining four schools were told a written request would come “in the next week or so.” The next scheduled conference board of control meeting is scheduled for Feb. 6. Since 2006, when Miami East joined the CCC after a stint in the Central Buckeye Conference, Covington has won or shared eight CCC titles in football (2006, 2007, 2010, 2011, 2012, 2013, 2015 and 2016), while Miami East has won or shared three CCC titles in football (2008, 2015 and 2017). Fort Loramie, which joined the conference in football and girls golf only in 2017 — the Redskins play in the Shelby County Athletic League in all other sports — won the CCC football title this past fall, while also reaching the Division VII state semifinals. In that stretch from 2006-2018, two of the 10 schools possibly leaving the CCC, Ansonia (2009) and TC North (2014) each won one conference title in football. If those 10 schools do apply to to leave the CCC, when that departure might actually happen could become the subject of debate. However, in a memo obtained by AIM Media Midwest that was handed out at the Jan. 18 meeting, the 10 schools that are leaving have expressed a desire to leave earlier than the two years stipulated in the CCC contract. Rappold said that if and when the conference officially splits, the four remaining schools would be unified in looking for more schools to join them in filling out a conference. Should the split come, which group of schools would keep the Cross County Conference name also could become a point of debate. “We’re not leaving, so from our vantage point, we’re still the CCC,” he said.